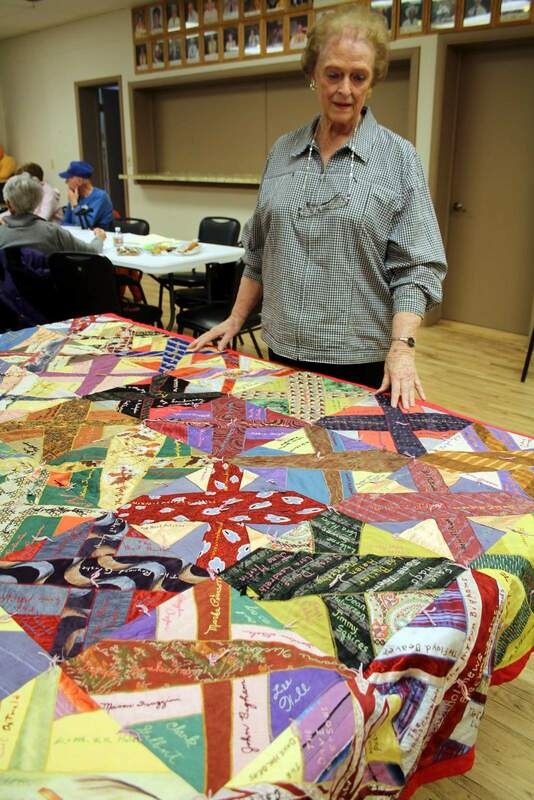 JoAnne McCoy has researched the Bayfield Friendship Quilt, which is now on display at the Pine River Valley Heritage Museum in downtown Bayfield. 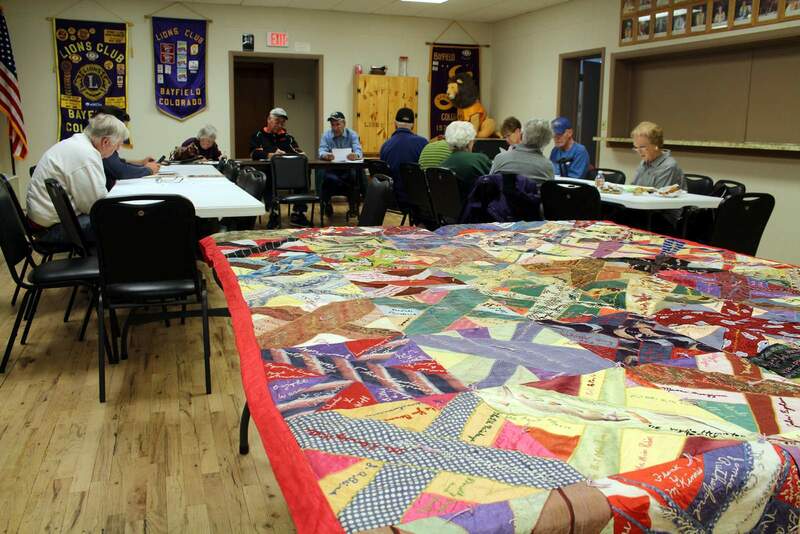 Members of the Pine River Valley Heritage Society meet at the Bayfield Lions Club in March. Society members have purchased a display case to showcase the Bayfield Friendship Quilt, foreground. 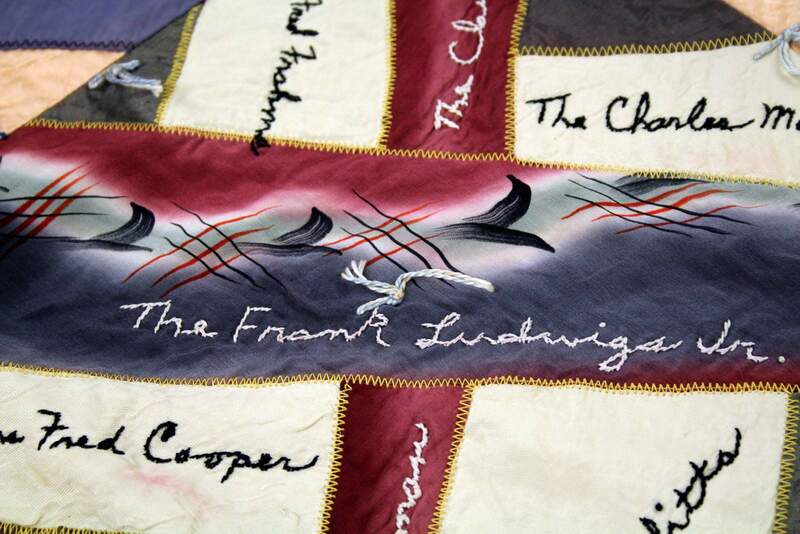 Members of the Frank Ludwig family embroidered their name on a silk tie to add to the Bayfield Friendship Quilt in 1950. The Bayfield Friendship Quilt, believed to be from 1950, is on display at the Pine River Valley Heritage Museum. A 68-year-old quilt that was made in Bayfield in 1950 has returned home. Members of the Pine River Valley Heritage Society are thrilled that an old tie quilt they believe was made here in 1950 is back in Bayfield. The quilt will be the newest piece on display at the seasonal opening of the heritage society museum, which will be from 10 a.m. to 2 p.m. Saturday. 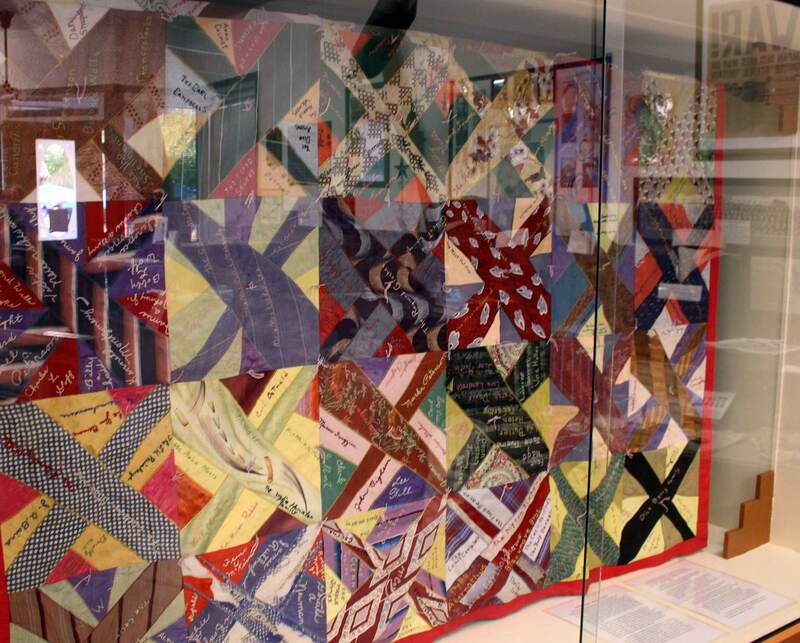 This winter, the museum received some photos of the quilt from Tina Davis, a quilter and collector. She had bought the piece on Ebay. The quilt is large, with squares a little over 10 inches wide, and is made from men’s silk ties with an x in the middle of each square. She remembers the quilt’s creation. Like other members of the group, she has no idea how it ended up being put up for sale, but they’re grateful Davis did the research to find out where it was from and return it. The museum is on the corner of Mill and Pearl streets in downtown Bayfield. Other displays in the museum include a hands-on one-room schoolhouse, a sheep camp exhibit, and displays from local memorabilia from World War I and World War II. More information about the museum is at www.pineriverheritage.org.